Before they took flight, the World War II, Korean and Vietnam War veterans, could not help but to reflect on their years of service. AUSTIN, Texas — Each day, there are fewer and fewer veterans of World War II, the Korean War and the Vietnam War. For those who are still here, many have yet to see the memorials built in their honor at our nation's capital. One local group is honoring them with a flight full of thanks. There was a grand gesture of gratitude on Tuesday at Austin Bergstrom International Airport. Hundreds of people lined the gates inside the departure terminal to show their support for the men and women who risked their lives for America. 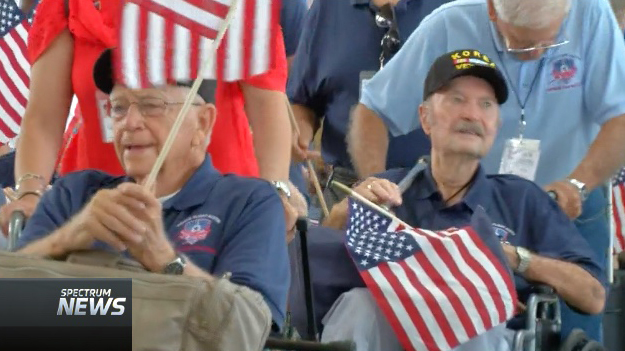 More than two dozen veterans took part in an Independence Day Honor Flight to visit the national memorials in Washington, D.C. and watch fireworks. For many, the experience is a trip of a lifetime.